Therapeutic proteins have become a very valuable addition to the repertoire of drugs to treat patients with severe diseases. Therapeutic proteins differ in many aspects from classical, small molecule drugs. They differ, for example, in molecular size, uniformity of the active, production, purification, contaminations, side effects, stability, formulation, regulatory aspects, and price. 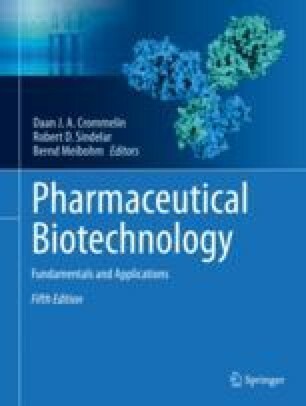 This chapter describes basic elements of the selection, design, cloning and production of biopharmaceuticals. The importance of the expression host in relation to specific post-translational modifications, such as the formation of disulfide bridges and glycosylation, is discussed. And finally, we describe the molecular biological aspects of the design and production of (humanized) monoclonal antibodies in cell culture. EvaluatePharma® World Preview 2017 (2017) Outlook to 2022. http://info.evaluategroup.com/rs/607-YGS-364/images/WP17.pdf. Accessed 3 Apr 2018.